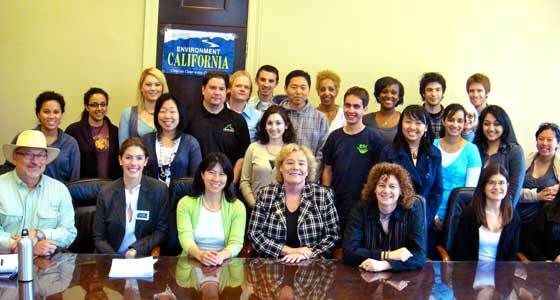 U.S. Rep. Zoe Lofgren meets with SJSU students to discuss sustainability. Photo courtesy of Environment California. While Big Wheels roared around a race track and students crowded an outdoor fair elsewhere, a studious but powerful group gathered to mark Earth Day. Around 30 of SJSU’s best and brightest met April 21 with U.S. Congresswoman Zoe Lofgren, attracted by the opportunity to affect change in the nation’s capital. The event was sponsored by the SJSU Environmental Resource Center, the Office of the President’s Sustainability Initiative, and Environment California. Lofgren sought “feedback” and to “bridge the gap” between young people here and her colleagues in Washington D.C.
A member of the House Committee on Science and Technology, she was well prepared to tackle just about anything students presented to her during the one-hour conversation. While the topics varied from nuclear power to ethanol to oil extraction fees, the group spent the most time on what geology major Ian Newman described as the “invisibility” of climate change. Vice President Al Gore’s “An Inconvenient Truth” convinced millions worldwide of the effects of global warming on the environment. But some of Lofgren’s colleagues in Washington continue to refute the science, perhaps because they can’t see the impacts in their own backyards. Lofgren also observed the situation is almost “too terrifying to contemplate,” and, like many long-term problems, gets pushed away given more immediate worries. She also made a very positive observation, mentioning the United States has come a long way since Earth Day was founded 41 years ago by the late Senator Gaylord Nelson, an SJSU alumnus. The whole concept of environmentalism has gone from fringe to mainstream, sweeping up lawmakers, academics and scientists as well as everyday people. View a Sustainability Week event schedule.